Whether carrying out a service, maintenence or rebuilding the engine, Haynes shows you how. 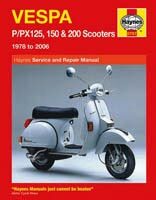 Piaggio / Vespa Scooters (1991 to 2009) Haynes Manaul. Whether carrying out a routine motorcycle service, general maintenence or rebuilding the engine, Haynes shows you how. Vespa Scooters (2005 to 2010) Haynes Manaul. Whether carrying out a routine motorcycle service, general maintenence or rebuilding the engine, Haynes shows you how. Vespa P/PX125, P/PX150 and P/PX200 Scooters Haynes Manaul. 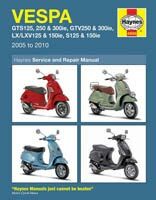 Whether carrying out a routine motorcycle service, general maintenence or rebuilding the engine, Haynes shows you how.